The second season of the “Lamborghini Blancpain Super Trofeo” championship is now under way. The very first races have just ended on the Hockenheim circuit in Heidelberg, Germany. The new Blancpain-branded Gallardo LP560-4 cars vied with each other throughout the weekend within the context of the DTM (Deutsche Tourenwagen Masters) championship. Blancpain once again salutes the remarkable performance of its President and CEO Marc A. Hayek, racing alongside famous driver Peter Kox of the Netherlands. This second season confirms the important place Blancpain occupies in the world of motor-racing. While now serving as official timekeeper for the new FIA GT1 World Championship, the Manufacture from Le Brassus also remains the title sponsor of the “Lamborghini Blancpain Super Trofeo”. 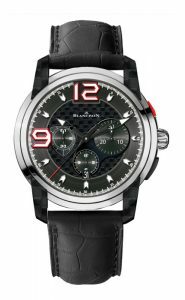 Blancpain has created an exceptional new sports watch in honour of this prestigious championship: the L-evolution Super Trofeo 2010* features a titanium case with all carbon-fibre dial and lugs. A chronograph model equipped with a flyback function, this timepiece is also distinguished by its appliques symbolising the Lamborghini Gallardo tail-lights and by its oscillating weight shaped like a double chequered flag, while, the alcantara strap is subtly reminiscent of car upholstery.